Site features free resources, improved user experience and responsive design. January 25, 2016 (Cleveland, Ohio)—StreamLink Software, creator of leading grant management and board management software products, is proud to announce its new website, www.streamlinksoftware.com. Designated product hubs for easier accessibility to AmpliFund and BoardMax information and resources. 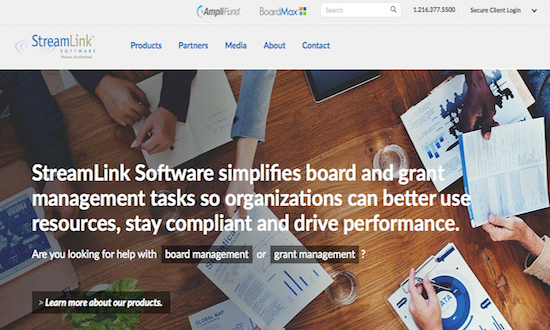 A library of free grant and board management resources, including white papers, case studies, guides, videos and webinars. Enhanced blog design and filtering system to simplify content discovery. A more intuitive navigation and full-screen responsive design for an improved user experience on both mobile and desktop devices. Customized content based on visitor industry and interests. Live chat functionality for real-time responses to product and site questions.